We enjoyed the Valentine’s Day Junior Mints, so when we saw these little Spring themed treats we had to give them a try. Alas, they are not nearly as yummy. We were hoping for colored chocolate, instead the familiar creamy mint center is coated in what appears to be just a soft candy coating. This does not contrast with the mint nearly as well as the normal dark chocolate. Cloying is an appropriate description. So, colored filling =win, colored coating = fail. At least for us. I think we’ll stick to mini York patties until after Easter. Yes, way too sweet. Bleah! 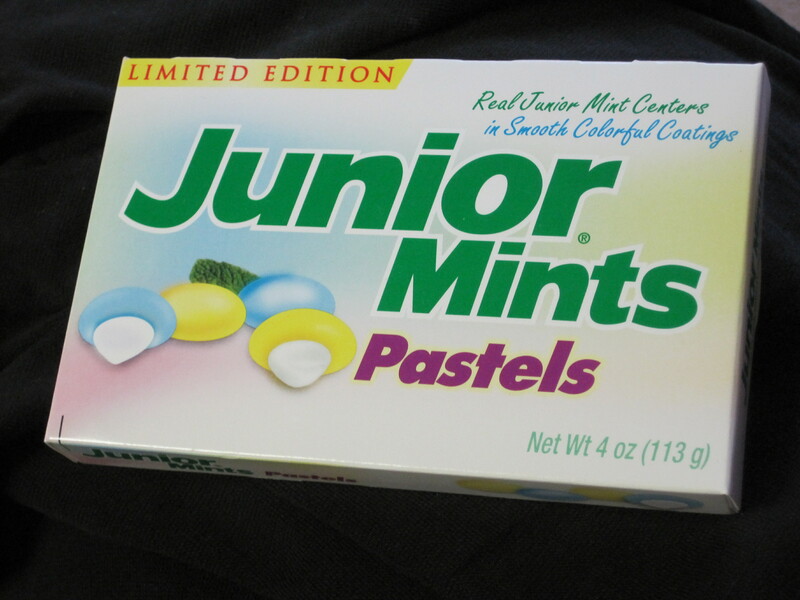 Oh Jr Mints… my favorite movie candy. I’m still going to try these!! I hate the “Syfy” thing. Hope they drop that sometime. The Wheel of Time is huge among my geek friend circle, but I haven’t gotten past the first book – need to read the whole thing sometime. I was a big Mercedes Lackey nerd when it was really popular. The Smores Hot Cocoa is at Hash House A Go Go at the Imperial Palace hotel in Las Vegas. Don’t know if I’d recommend the food, but the cocoa is AMAZING. Love these little mints, I don’t eat chocolate as it gives me migraines but these yummy little treats are perfect. Love the smooth taste without the chocolate. The only problem is I can only find them in one supermarket and no other stores carry them.